Staff-Side stated that while the Uma Devi judgment is clear and the instructions have-been-issued by-DoPT, there are cases where the casual labourers have not completed 10 years on the date of judgement. 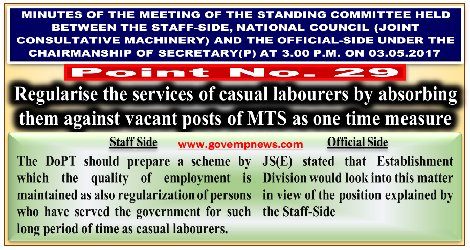 The Staff-Side said that the recruitment procedure adopted while engaging the daily rated workers was one and the same for regular employment especially those kept for erstwhile Group-D functions. Therefore, they cannot be said to be backdoor entrants. This apart, they added that such recruitment on purely temporary basis was necessitated and initiated due to the all pervading ban imposed by DoPT in 2001 and continued for almost nine years. Therefore, they said that it is necessary that the DoPT should prepare a scheme by which the quality of employment is maintained as also regularization of persons who have served the government for such long period of time does take place.